Huzzah and hooray! A world class detective and a passionate doodler are back in the continuing series of two popular Candlewick Press middle grade books. 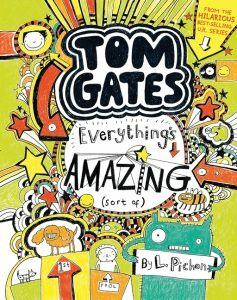 If you’re not familiar with either either Timmy Failure or Tom Gates, please take a look at earlier reviews of previous titles right here at Good Reads with Ronna (see below). Both series are a hit with fans of Jeff Kinney’s Diary of a Wimpy Kid and employ a diary or journal style novel filled with pen and ink illustrations. The illustrations not only add to both series’ humor, but, as one of my students, a reluctant reader (and now big fan) told me: the illustrations increase his understanding and enjoyment. Both are recommended for ages 8-12. 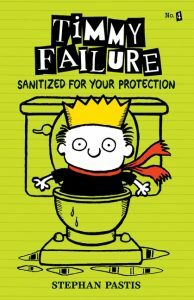 So check out more hilarious adventures– and misadventures– of Timmy Failure and Tom Gates. The young “ … founder, president, and CEO of Failure, Inc, the greatest detective agency in the nation …” is forced to go on a road trip to Chicago to help his mom’s boyfriend move, instead of working on his latest case: the theft of money from a school fundraiser. Extremely put out, Timmy endures miles of cornfields and country-western music with his mother, Doorman Bob, his polar bear ex-partner, Total, arch-enemy and “criminal mastermind,” Molly, and her family. Like the Pink Panther’s clueless Inspector Clouseau, the equally clueless Timmy accuses everyone but the actual thief and tries to elicit confessions from the innocent while advising them on their “Carmen Miranda” rights. Can Timmy solve the case while far away in Chicago? Can he trust Molly, one of his many suspects, to help him find the crook? Be prepared for “greatness!” Visit Candlewick Press for information on the books and see Pastis’ wonderful Timmy Failure website for more information on the series, the characters, trailers for each book, and activities. Read Good Reads with Ronna’s past reviews of the Timmy Failure series here. Tom has a lot on his mind and some big problems. Not his usual problems: an irritating older sister, an obnoxious classmate who is always trying to get him in trouble, school, teachers, and math homework. Actually, any homework. No, he’s got much bigger worries than that. His birthday is coming up and no one seems to notice the wish list he’s conveniently posted on the refrigerator door. His weird, but sweet grandmother has promised to whip him up a special birthday cake. Not so good … she’s been known to mix jello and peas together. His parents have promised to take him and four of his friends to Dino Village for his birthday (where his father works). Four friends? No problem, he’ll invite best “mate” Derek, Norman, and two others. Things quickly go awry, when Amy, the girl he has a crush on, sees the invitations and asks if she can come … and bring a friend. He agrees before realizing the numbers (there’s that pesky math again) don’t add up to four. His band, Dog Zombies, which includes Derek and Norman, has been “volunteered” by Principal Keen to perform at the school dance. The inexperienced trio, with only one previous engagement under their belts, is going to need a lot of practice. A lot! Even worse, Tom’s father, a loveable and delightfully quirky man, has been hired to be the DJ at the school dance. He plans to wear his dinosaur costume from Dino Village … and silver disco boots. Positively cringe-worthy. Will this doodler and homework dodger get what he wants for his birthday? Will he figure out how to include Amy and his four friends at Dino Village? Will the Dog Zombies go up in flames at the school dance? And then there’s his father … and his grandmother’s special birthday cake. Read the book and be prepared for a laugh-out-loud experience! Oh, in case you don’t speak British (“choon” means an excellent tune), Pichon has included a British to American glossary. Don’t forget to check out the recipe for Tom’s “Doodle Toast” at the end of the story. Visit Pichon’s and Candlewick’s websites for more information on the author and the series as well as fun activities. Reviewed by Dornel CerroVisit Dornel’s blog, Mile High Books, here.